You're invited to an end of year Pitstop! As the days get longer and the nights grow colder there’s a truth that makes me feel a little bit uncomfortable – winter is here! You can ignore this fact if you wish, but the likelihood is that if you carry on wearing summer clothes in this weather (like I did last week*) you’ll find yourself feeling rather cold. Another truth which might make you feel uneasy is that the end of the year is edging closer and closer, in fact, there are now only 54 days until 2018 arrives! Whoa. Is it me or does time seem to speed up for the last six months of the year? I’m learning a lot about my relationship with time at the moment (really enjoying Oprah & Deepak’s 21 day meditation challenge on making every moment matter). And I am now much less stressed about time ‘running out’ than I was last year. Nonetheless, November's arrival can cause anxiety and concern if you feel you aren’t quite where you hoped you’d be or haven't quite done what you planned to. If this resonates, I want to reassure you that you’ve still got time, in fact you’ve always got time, and more than you think – time is actually all we have! · Have you achieved what you set out to this year? · Do you struggle to remember all the goals you had for 2017? · Have you found it hard to remain focused on your goals this year? · Have you procrastinated more than you’d like? · Are there some important things on your 'to do list' that keep winding up undone? · Would you like to tackle any of them before the year is out? If you’ve answered YES to at least two of the above questions, you're not alone! I've decided to run another Pitstop event following the success of our first ever in June. Pitstop is an all-day workshop (think of it as a mini-retreat) that's designed to support you to both learn from the past and plan for the future in a mindful, compassionate way. Our end-of-year Pitstop is on Saturday 2nd December in Central London 10AM – 4PM. In the morning we will focus on compassionately reviewing the progress that you’ve made this year so that you can learn from the past, gain new insights and then let it go. We will empower you to increase your awareness, self worth and confidence. The second half of the day we will focus on goal setting, stress management and how to stay accountable, motivated and focused in order to succeed with your 2018 plans. We will also explore what can hold us back from achieving our goals and how best to tackle these barriers to success. + You’ll meet like minded ambitious, creative entrepreneurs and business leaders who are also ready to take their personal and professional development to the next level. + You’ll learn how to increase your focus and motivation levels and how to become more accountable. + You’ll discover more of your potential, learn to stand in your power, prioritise your needs and set clear boundaries to support your progress. + You'll start work on creating a strategic action plan so you're ready to kick start your 2018 progress with clear goals for all areas of your life. 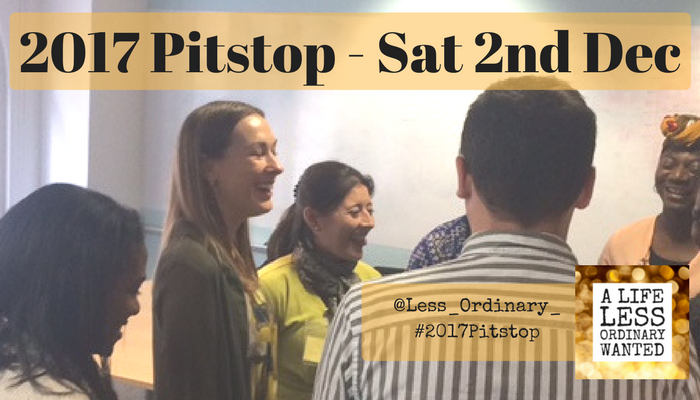 The Pitstop will be facilitated by myself and members of the Less Ordinary team- all of whom are experienced personal development experts. A safe, supportive environment will enable you to take valuable time out for yourself to reflect and focus before the xmas rush. Special offers will be made available exclusively on the day for attendees interested in investing in additional Less Ordinary support in 2018. What did the attendees of our mid-year Pitstop in June have to say about their experience? "Pitstop is truly a space for personal and professional transformation. I hope it continues. Thank you team Less Ordinary!" "I am so pleased to have taken a bold and brave step forward. The Pitstop event brought so much clarity, with its useful tools/ materials in order for me to achieve far more than I initially had set. I am glad that I listened to my intuition and invested in attending this event." The best time to start planning for 2018 is before it arrives. Keen to join us on Saturday 2nd December for your end-of-year Pitstop? Fabulous, it's like an early Christmas present to yourself that will keep on giving throughout next year. Get 10% off an early bird ticket if you book before 6PM today with code 'LINKEDIN'. A light breakfast, delicious lunch and hot drinks are included with your ticket. We know the best goal setting takes place when we have happy stomachs so all dietary requirements will be carefully catered for - just let us know what you need. Remember the best gift that you can give anyone, including yourself is time. I personally know that friends who set goals together are more likely to achieve them so we’ve also got an ongoing special offer for you and yours - book two tickets for you and a friend and you’ll save £10.00 per ticket. + Super early bird tickets are now SOLD OUT. + Limited early bird tickets are ON SALE until Friday 17th November @ 6PM. Any questions at all, please do get in touch. I really hope you can join us. *My vests are now (yet again) resigned to be undergarments for the next 6 months.